This Discovering Eden Valentine’s Day Duet suits exactly as the souvenir of your chaste passion for your partner on the day of St. Valentine and to thereby illuminate his/her face with a broad smile. 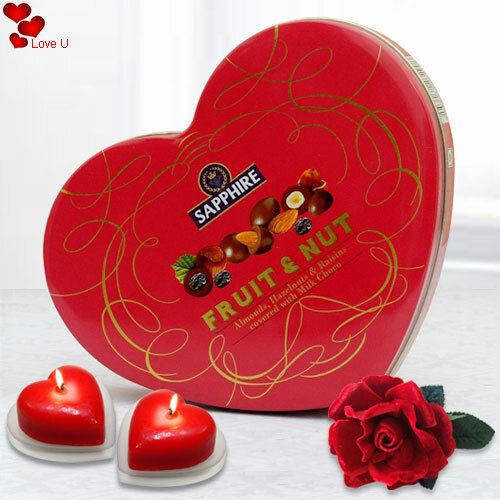 This overwhelming Duet embraces 1 flavorful Heart-Shaped Fruit n Nut Chocolate Box from SAPPHIRE and 2 stimulating Love Candles. Flowers Delivery Virudhunagar, Send sweets Gaziabad, Wedding Cake Anand, Diwali Mithai Hoshiarpur, Send Flowers and Gifts to Kolahpur, Online Shop Hissar, Flower to Bharatpur, New Year Flowers Tellicherri , Fresh Fruits Ajmer, Send Gift Vadodara, Dry Fruits to Nadiad, Birthday Delivery Krishnagiri, Sending to Nakoda, Flower shop Hapur, Dholpur Online Cake Delivery.